Are tomatoes and cucumbers. Yes!!! Still! They are slowing down a bit. We can now leave the property for a few days without coming back to a squillion cucumbers – we picked 16 the other day. As it has been a bit cool lately, the tomatoes are taking much longer to ripen and not colouring as richly as those shown here. The plants are beginning to look very sick, too. It won’t be long before I pull them out. Since I figured you would be so bored with my tomato and cucumber saga, I decided to take a few arty shots to make it a little more interesting. You will note that the tomatoes in the photo below are not Romas. I don’t know what variety they are except they are the ones you usually buy at the supermarket. I have had, at least, 10 kilos of tomatoes from this bush… and I didn’t even plant it!! It was self-sown! Is my new bowl. The other day, Maus came into the house and asked, “Do you want a new bowl?” What a silly question. Of course, I did. As I may have mentioned before, my Maus likes to recycle things. Not long ago, our washing machine in Perth died so we had to buy a new one. Maus spent a day pulling the old one apart, looking for bits and pieces that could come in handy one day. My new bowl was from the door of that old machine. It is perfect for fruit but I also think it would be oven proof. If so, it would be absolutely fabulous. Does anyone know whether the glass door of a front loader is oven proof, please? I found one site that indicated that it would be. Are lots and lots of passionfruit from my neighbour, Renate. I have been making passionfruit syrup to drizzle on my yoghurt. 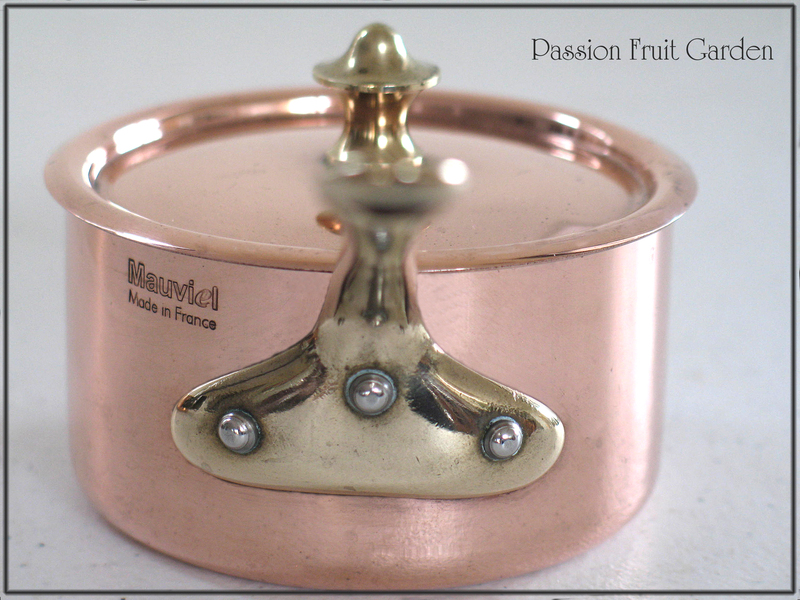 Is Maus’ Mauviel copper ware. She polished them just for the photo which was very nice. One Christmas Eve, when I was still working and extremely time poor, I was in a dilemma. I had not bought Maus a present. I had asked her about 100 times what she would like for Christmas and each time she had said that she didn’t need anything. Suddenly, in a moment of desperation inspiration, I figured Maus would like some quality cookware. Why? I do not know; she had never indicated that she would. 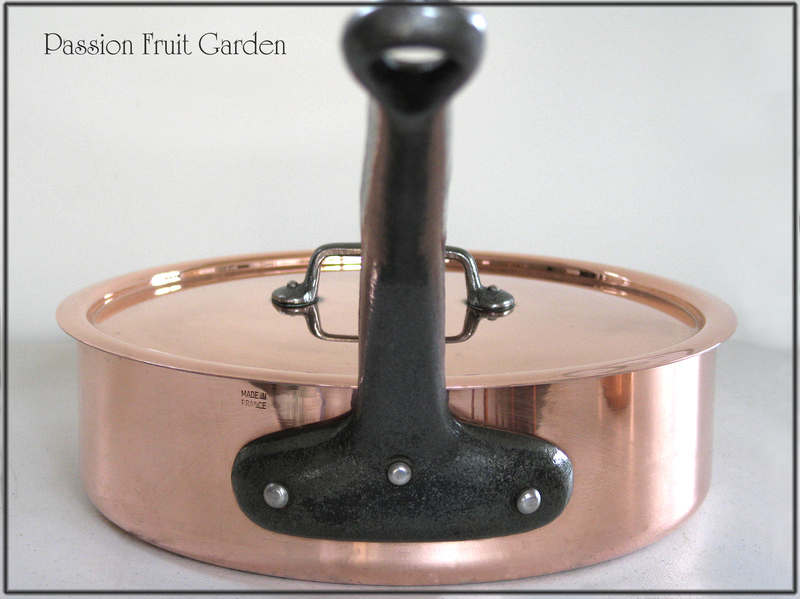 I raced over to the local Kitchen Warehouse shop and bought Maus this stunning Mauviel sauté pan. I am sure she likes it because she polishes it regularly. I love it. I use it all the time. It really is to die for. Is this cute little condiment pot that Maus bought whilst we were on holidays in France one year. I have never used it but it is very cute. Is this gorgeous little sugar bowl. It was a gift from my friend, Alyson, years and years ago. It is part of The Royal Collection. The Royal Collection reflects the personal tastes of British sovereigns over the last 500 years. This range commemorates the golden age of Queen Victoria (1819-1901). The design takes its inspiration from English bone china commissioned by Queen Victoria for the Great Exhibition of 1851. Is this little dish. It used to be my mum’s. There are no markings on the back and I haven’t been able to identify the design. Desert scenes were very popular in my mum’s time. There are many items on the web but not this particular one. Are these gorgeous little plates I bought in France. The are Limoges and the design is by Guy Degrenne. The beetle is stamped number 26 and the butterfly number 19. Again, I haven’t been able to find any information on them. Are two demi-johns and a flagon of not-so-nice vinegar. 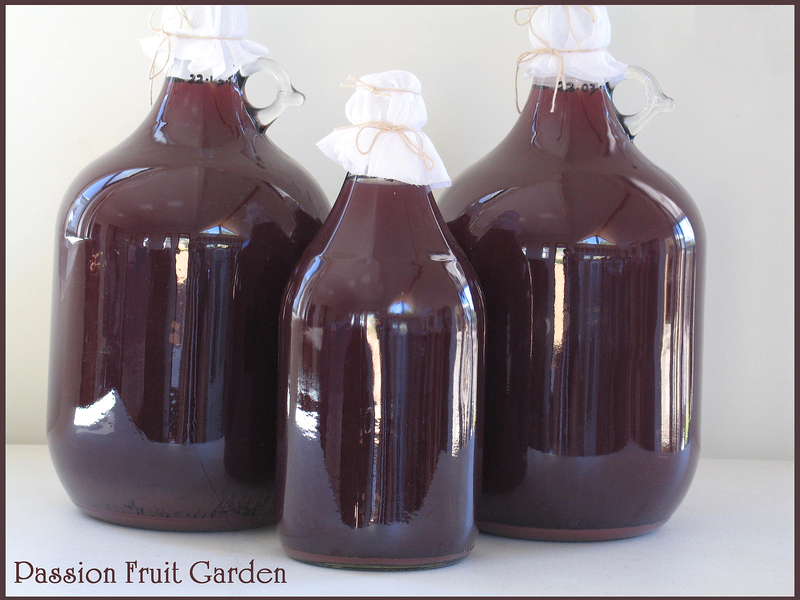 It is the result of my grape pressing ordeal. Because it tastes sort of weak, I decided not to seal it but cover it in muslin in the hope that as it evaporates, its flavour intensifies. I will keep you updated. Is more experimental vinegar. The container is Bendigo Pottery. For those who don’t know, Bendigo Pottery is very collectable these days. An old friend of mine, Jann, gave me this mini-keg because it leaked (it still does, no matter what Maus tries). About three months ago, I finished a bottle of balsamic vinegar and there was a considerable amount of slime in the bottom of the bottle. I was keen to see whether it was alive and would grow so I sacrificed a nice bottle of red. I put it and the slime in the keg. I checked it after 3 months and the slime looked like it had grown. 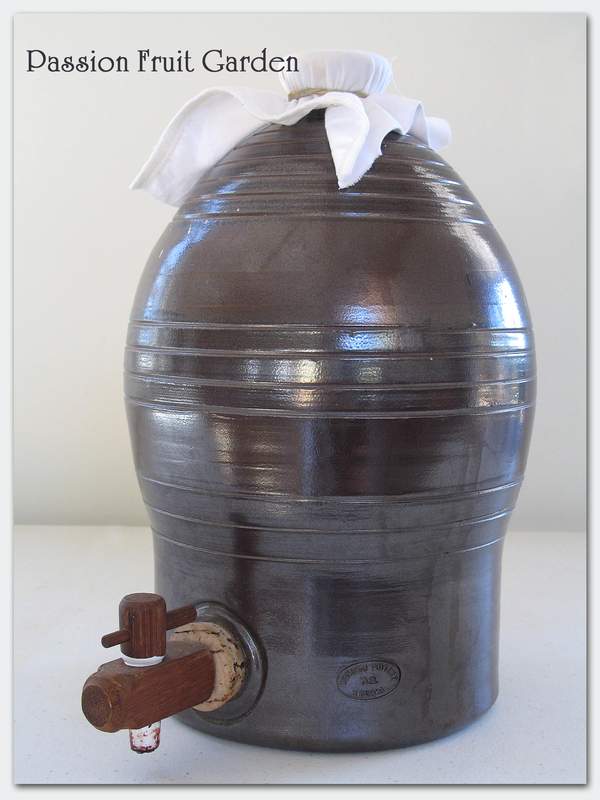 I also had a flagon of very bad wine I had made that tasted as if it was half way to vinegar so I added it to the keg. I will give it another few months and have a taste. 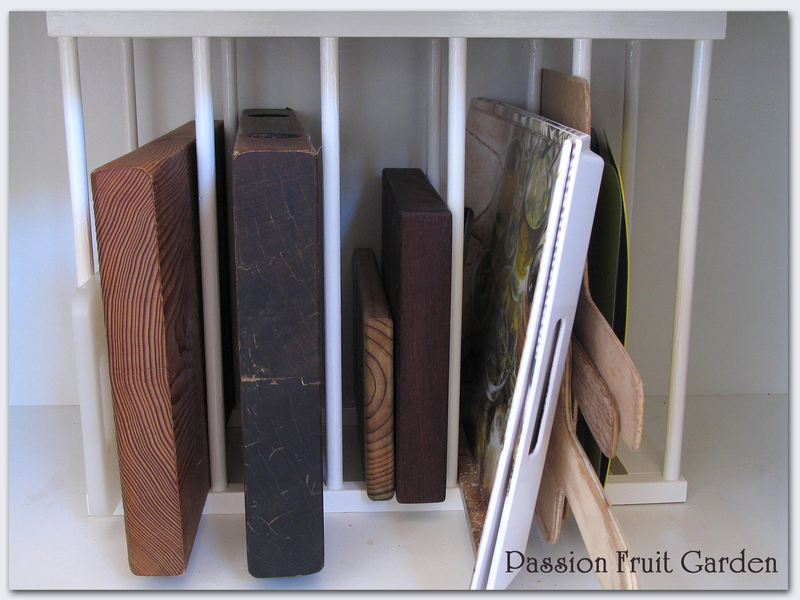 Is this new rack that Maus made to store our chopping boards, trays and paddles. It is great because it stops them falling over all the time. She made it out of an old baby play pen. When we first got Lily and Maggie, we bought an old fashioned play pen for them to sleep in. It was still in good condition when they ceased being puppies but then Jules came along and it was gnawed to bits. Maus saved some of it and… voila!! 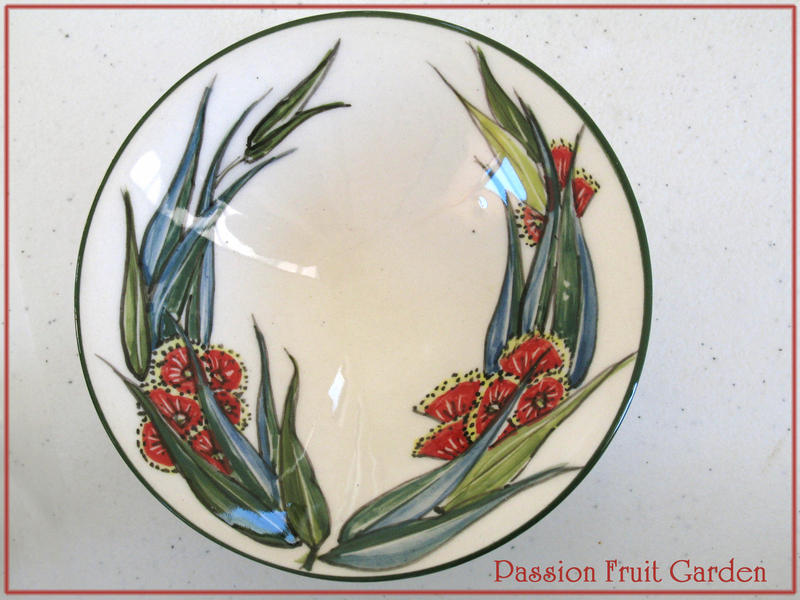 Is this gorgeous little plate I bought in South Australia last year. It was hand made by Sandy Fraser, Mount Compass, Fleurieu Peninsula (South Australia). This entry was posted in In My Kitchen and tagged Bowl from front load washer, Desert design plate, Homemade vinegar, Limoges Guy Degrenne, Mauviel copper ware, Passion fruit syrup, Sandy Fraser, The Royal Collection by Glenda. Bookmark the permalink. Wishing you both the best of season & beyond. Currently on Phillip Island in Victoria with all the kids..great spot. Hi Trish, Enjoy your holiday. It would be good to catch up. 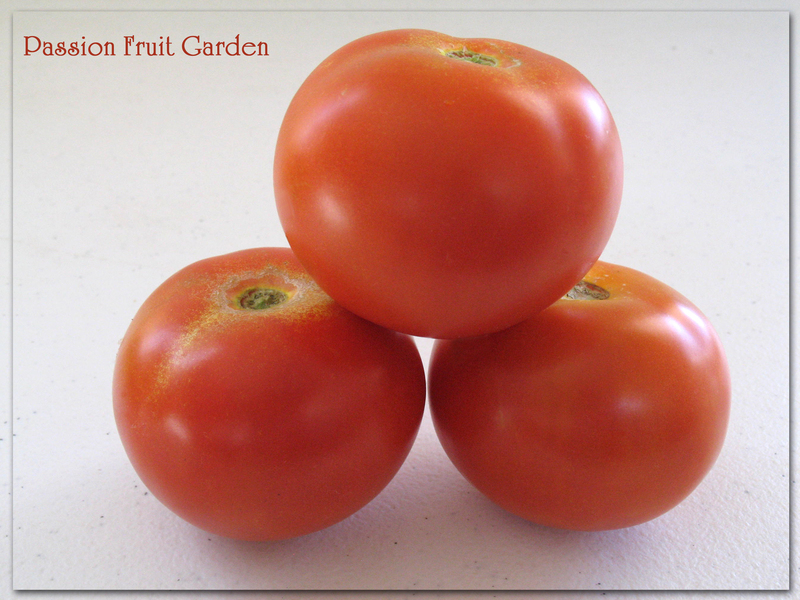 Those tomato photos are amazing – it took me a while to figure out what the first one was! And I, too, want to know if washing machine doors go in the oven. I doubt I will ever have a personal need to know this, but I am now beyond curious! Hi Catherine. Thanks for stopping by and commenting. I am informed from a reliable source (a friend) that it is made from tempered glass so it most likely is!! I am going to try it some day soon. I love the recycled bits in your kitchen this month! And you can make green tomato chutney if you want to pick the last few of the vine. I am not sure my cucumber has done anything as we have had too much wind recently. Hi Tandy, thanks for visiting. I love to recycle things. The bowl looks great. It is a bonus that it is heat proof. Your Maus is wonderfully creative, you two make a wonderful team! That line up of tomatoes is amazing! 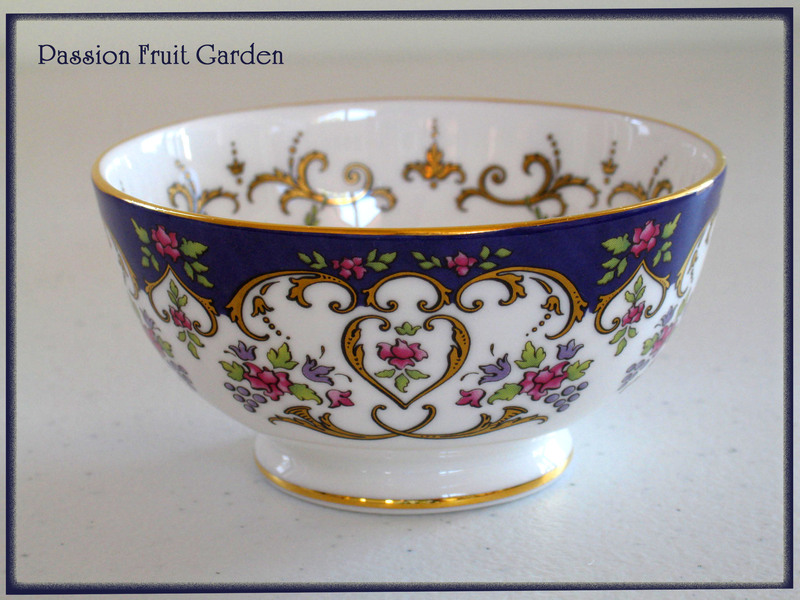 And I have a match to your little bowl – a Royal Albert bowl – a mug in the same design! 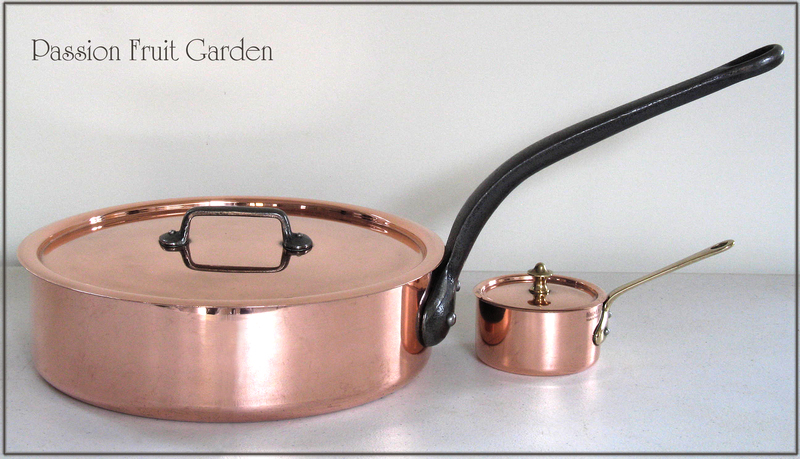 Was that copper saute pan the one you had re-plated when you were here in Sydney? Hi Celia – so we are twins!!! This is a different pan. The ones we had replated in Sydney were hand made in France with a tin lining. It is the tin lining that has to be regularly re done. The saute pan is a Mauviel. It has a stainless steel lining so is good for life. The tin pans are supposed to be better but it is so hard to find anyone who knows how to retin them properly in Australia. Wow, so many good things in your kitchen this month, Glenda. 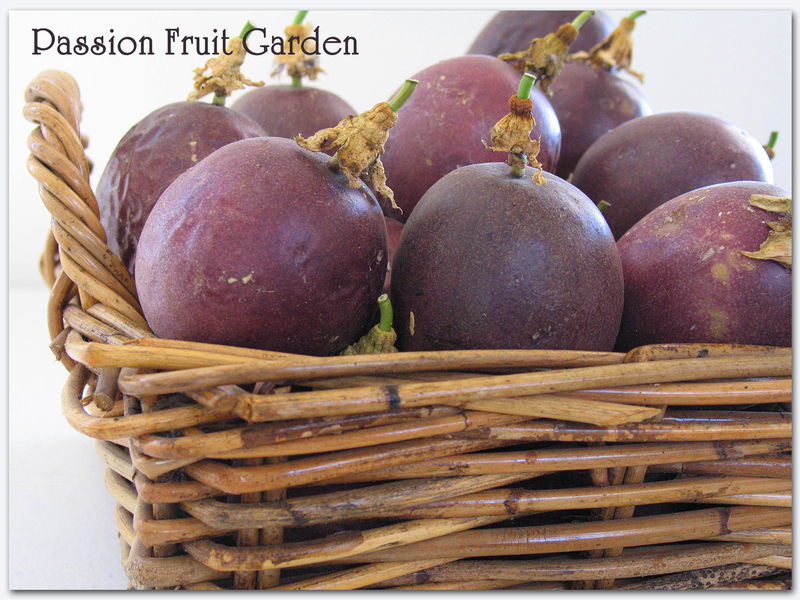 Love those passionfruit! How fresh and delicious! That first shot of the tomatoes is a cracker… I thought it was a baton! The glass in your new bowl is a form of safety glass called tempered glass which is 4-5 times stronger than normal glass. It is manufactured by extreme heating and rapid cooling making it harder than normal glass. The thermal process that cures tempered glass makes it heat resistant. They use tempered glass in oven doors, carafes for auto coffee machines, side & back windows in vehicles as the windscreens are made of laminated glass, shower doors anywhere where there is a safety issue as the glass only shatters into small even shaped pieces. I am sure if they use it for oven doors it would be ok for the oven – but your choice!!!! Your Maus is such a clever gal. Just love reading your blog. Hi Deb, you are so kind and, yes she is pretty clever. 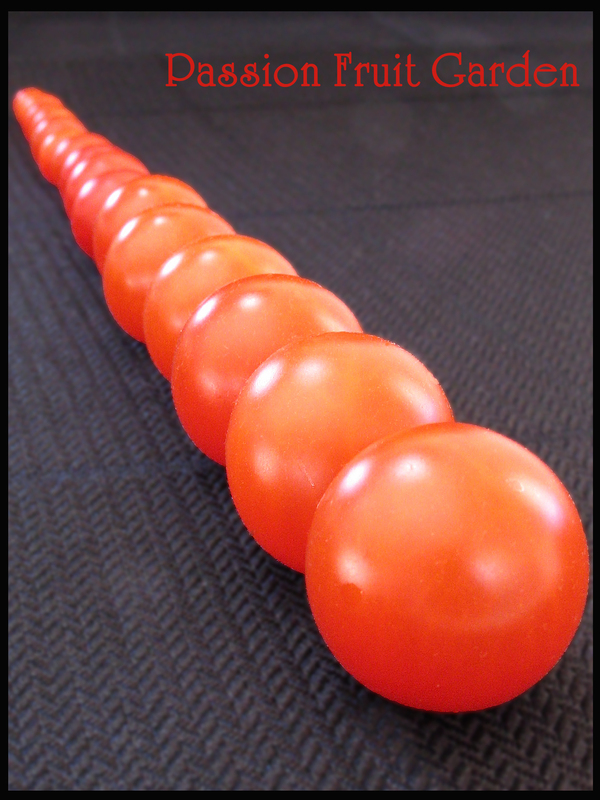 Your tomato “line-up” looks too perfect to be real. Very nicely done. Amazing that they are the result of a self-sown seed. I’ll be happy if any of the seed I’m planting will be half as prolific. The copper cookery is beautiful, as is the dish with the desert scene. 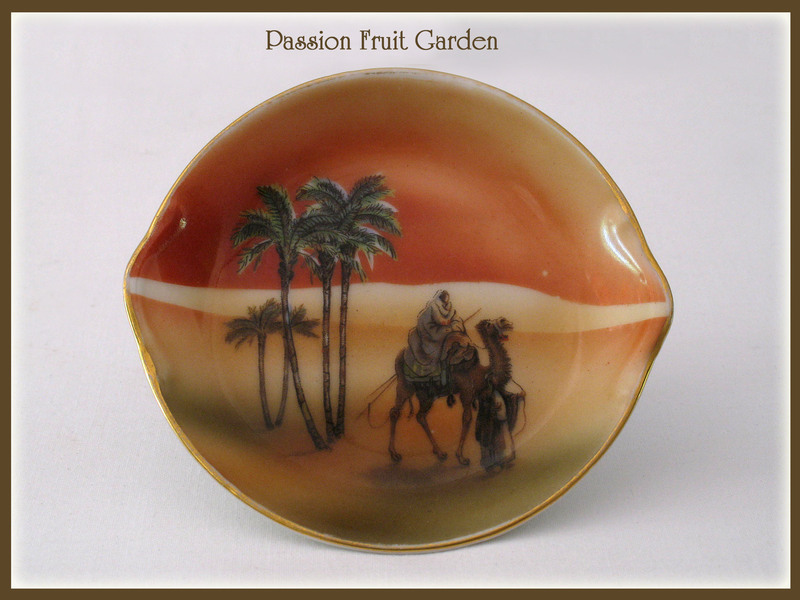 Could it be a representation of the “Flight into Egypt.” You’ve so many nice touches in your kitchen, Glenda. Thank you for sharing them with us. Hi John. I don’t know about the little dish. I thought it would be easily identifiable on the web but I can’t find anything. I will search ‘flight into Egypt” and see if I get anything. Thanks for the thought. Hi Lisa. I love my new bowl, it is very unique. You have some beautiful things in your kitchen and I just loooooove the tomato pics!! 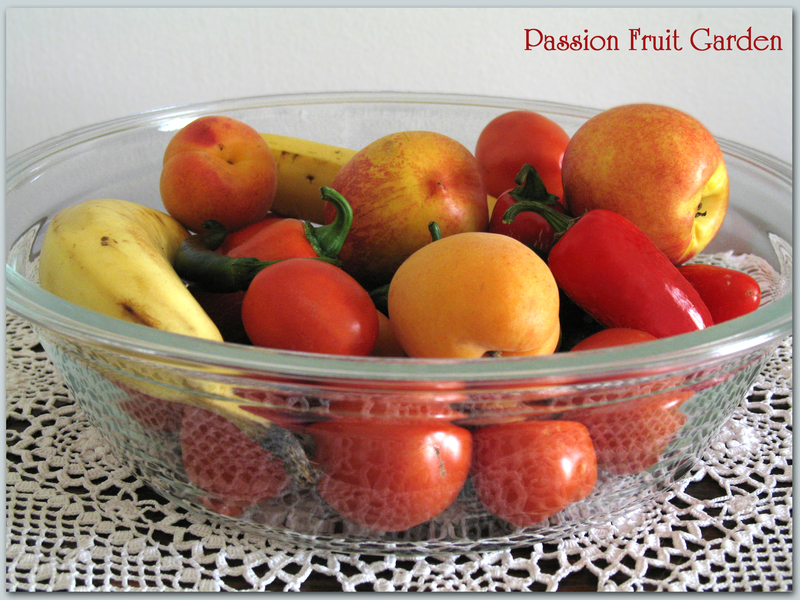 I am so envious of your tomatoes and passion fruit! I also love the pottery – especially the Royal Collection – which is made in Stoke on Trent near my husband’s birthplace. Hi Pat. Lying under the tap – now that is a good idea! Thanks for stopping by. Hi Christine – Jordan, how fab. We are off to Lebanon soon. Oh I love your bowl – possibly the manufacturer could tell you if it’s oven-proof! 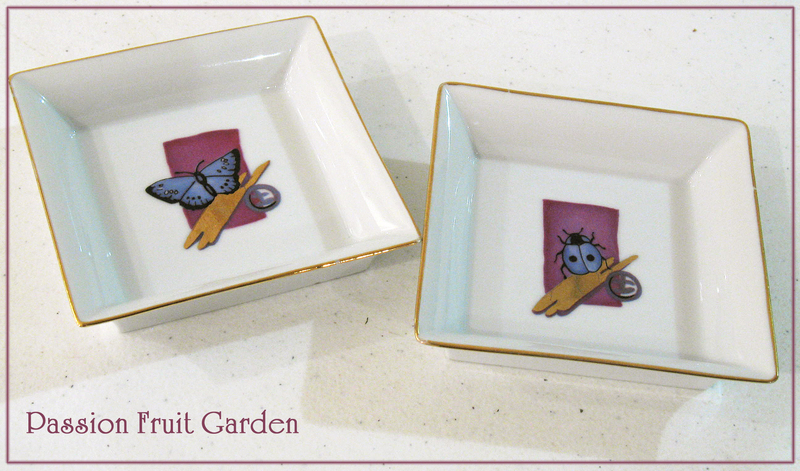 Your cutting board holder is so clever – your Maus is just too brilliant for words and your sugar bowl is exquisite!